Next up, Michael Gingold writes about the controversy surrounding Silent Night, Deadly Night and its sequels. From then on, Yuletide Terror becomes a little bit of everything. 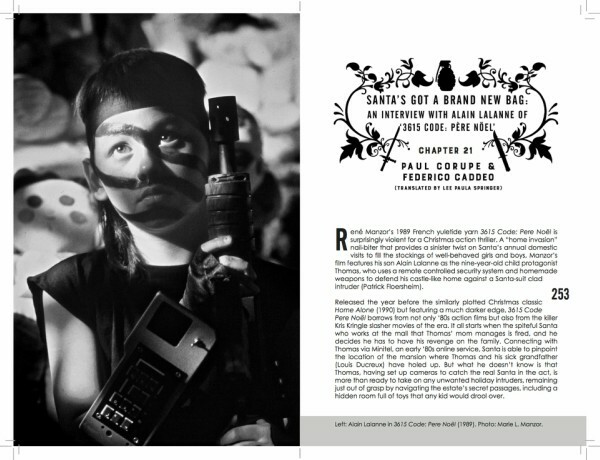 You have chapters on lesser-known films such 3615: Code Père-Noël, horror films that take place during the holidays but don't have that Christmas atmosphere (P2, A l'intérieur), macabre comedy (The League of Gentlemen Christmas Special), and crime and suspense movies, such as the 1961 classic Cash on Demand with Peter Cushing. The book also contains essays on the different versions of A Christmas Carol and a section on how ghost stories have been linked to the yuletide and winter throughout history. The essays are interspersed with interviews with Elves' director Jeff Mandel; Christmas Evil's Lewis Jackson; Silent Night, Deadly Night actress Gilbert McCormick; Campfire Tales co-director James Talbot; And All Through the House screenwriter Fred Dekker; and 3615: Code Père Noël's Alain Lalanne. In the second half, you get an overview of all the yuletide horror movies you can think of, most of which are only reviewed briefly. This is where you'll learn about a multitude of horror movies you have never heard of, as well as popular choices which you've never considered as a Christmas film but take place at the yuletide season (such as Psycho). As you may have noticed from the description, Yuletide Terror is a little bit of everything: essays, interviews, reviews, etc. While this mixture may be an advantage to some, I would have preferred a more straightforward approach where you know what to expect from each chapter. When it comes to consistency, I also disliked that some of the films got more than one chapter, while other equally important films were only mentioned briefly. I'm all for clarity in this type of book and having multiple chapters on the same film and different approaches didn't quite work for me. However, many of these genre books do that, so I guess it's just a matter of opinion. On the good side, Spectacular Optical managed to assemble 33 of the most talented and knowledgeable horror film analysts and critics for this tome – Amanda Reyes, Kim Newman, Mike Gingold, Stephen Thrower, Lee Gambin, etc. These people know how to bring you the most interesting and in-depth information about the films you love, all the while introducing you to rare cinematographic gems. 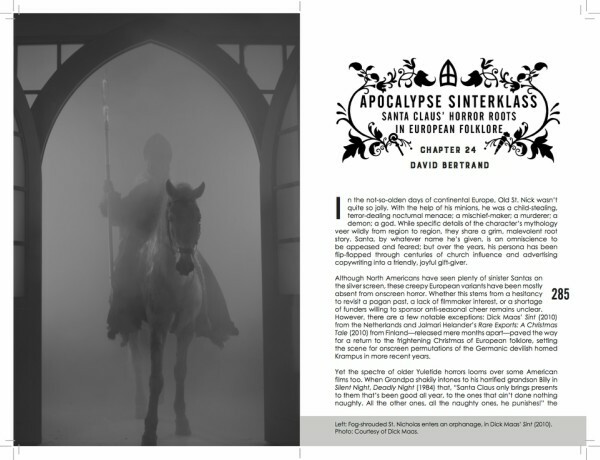 Extra kudos go to editor Kier-La Janisse who was responsible for the book's layout. Just like in House of Psychotic Women, the visual look is sublime and belongs to the best within the horror movie reference books range. The images are not only simple screenshots but also include newspaper clippings, film posters, illustrations, magazine covers, set photos, and killer Santa cartoons. While the majority of Yuletide Terror is in black and white, you have one section in the middle with several pages of color photographs. 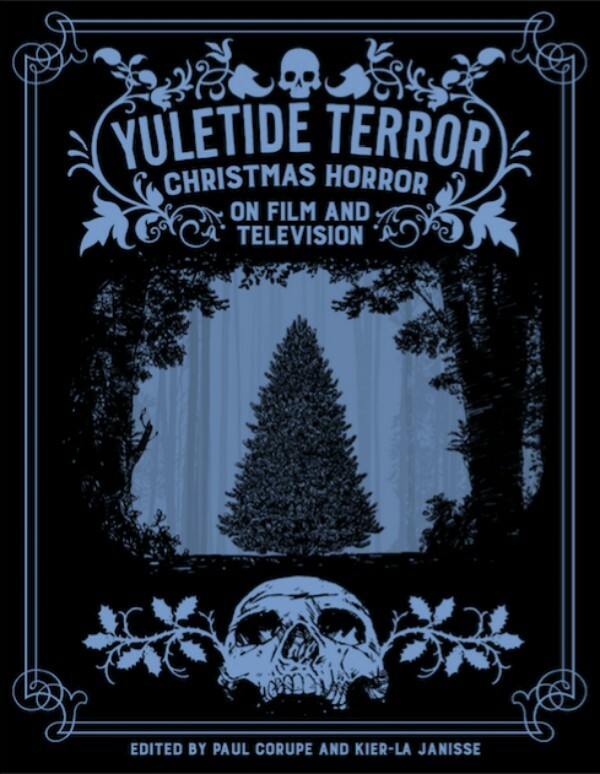 Where to find Yuletide Terror? Yuletide Terror can be ordered from the Spectacular Optical website. Sounds like some fascinating looks into horror. I shared a trailer of Black Christmas on my post today about Christmas horror films. Just a fun little post with trailers. Have a Merry Christmas! Nice And Very useful info.Amazing write-up....Thanks! Get 100% flawless singapore tuition assignments support services and perform best in college with submitting high quality assignment on time at cheaper price . Avail my assignment help services from leading academic writing service providers company. Our top class academic writing services is know for best quality work and expert assistance. StudentsAssignmentHelp.com help students to maintain a balance between their academic writings and job responsibility. Our team of native English assignment writers offer the best Homework Help services for the students. We never charge any extra cost from our clients and deliver them assignment help at a low price. studentsassignmenthelp.com help students in their assignments,They get best assignment help USA by our experts.We didn't charge extra from our students.We provide assignment writing services in all over USA. With the best team of masters and Ph.D. degree professionals that understand students all the demands and easily complete the task properly. We working with the team of native writers from the USA, Ireland, Australia, Singapore, UK, New Zealand, etc. Experts are ready to offer you business assignment help. Students need dissertation writing? Don’t worry, we provide the best dissertation writing service on our web portal. You can easily hire our experts and write to them. This is the best option for students. At StudentsAssignmentHelp.com best team is continue giving best and high-qualified free research paper ideas. The experts in our team have knowledge in various academic disciplines and these are as English, economics, history, management, IT, law, arts, nursing, hospitality, etc. So students can easily get the best assignment and continue giving today.